Do you have small children who are constantly nagging you about snacking throughout the day? My little ones are grazers. Young children need to eat periodically all day and grazing is very healthy. However, my kids tend to ask for snacks that are full of sugar and empty calories. Children who eat healthy snacks are more likely to eat a good meal as well. Wouldn’t it be nice if your children asked you for some avocado for a snack? I bet you would be thrilled if your child sat down to eat a rice cake or decided to eat a bowl of cottage cheese instead of sugary sweetened cereal. The Snaxx box also includes three time cards. 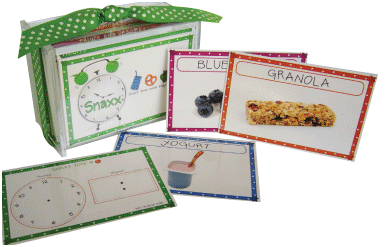 You and your kids can take a crayon and write in the desired times for snacking on the cards. It can be erased later with a damp cloth. Once the times are chosen you can then have your child match the snack times with a real clock and pick a snack card during that time. My kids love learning about the facts on the cards. Using the Snaxx box is a great way to get them involved in choosing their snacks. You can purchase the Snaxx box directly from Mini Bean, LLC or enter for a chance to win it by leaving us a comment. For every entry including extra entries please leave a separate comment. Winners will be chosen randomly from the comments and e mails that I receive. The contest ends on October 26, 2009 at midnight PST. I'm loving your blog! I just started one of my own and would love for you to stop by. What a creative and fun item! What a cool idea–I hate arguing about snacks! What a cool idea to encourage healthy snacking!! I would LOVE this for my boys!